No crimp press or applicator modifications required. Simply place the Smart Chopper on the work table in a convenient place for the operator. Integrated trigger sensor. When the operator inserts the defect and touches the trigger the chopper fires. Integrated metal detector sensor. 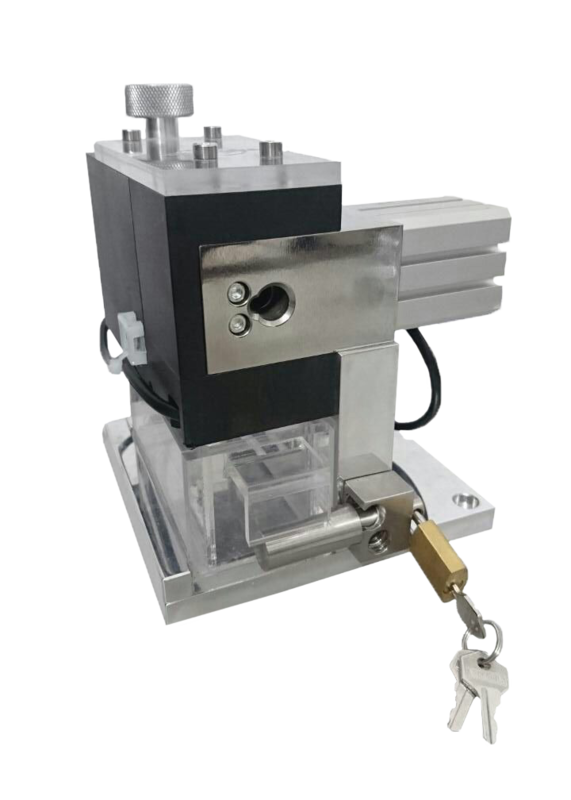 When defect falls through the metal detector the crimp Force monitor is automatically reset. All cut sample fall into a locked scrap box. A key is required to open the lock box. At the end of the shift the defect count from the CFM must match the number of samples in the locked scrap box. Absolute control and accountability of all the Crimp Force Monitor defects. What happens to the defects that are detected with your Crimp Force Monitors? The "Smart" chopper is installed to provide 100% control and accountability of all the CFM defects. Every defect has to be cut and detected by the integrated metal detector sensor before the press can crimp again. All the cut samples fall into a locked scrap box. At the end of the shift the quality department compares the Smart Chopper defect count with the CFM defect count.